I keep forgetting to put this up! I am so sorry :l We have a Bread Route & I have looked at hundreds of loaves of bread with this Nature's Own Sweepstakes on them! shame on me plz forgive me friends big oops on my part blahh. The “Big Green Giveaway” Sweepstakes ("Sweepstakes") will begin at 12:00:01 a.m. Eastern Time ("ET") on May 1 , 2014 and end at 11:59:59 p.m. ET on September 15 , 2014. 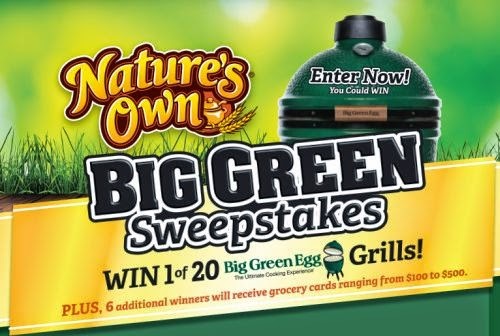 Win a Big Green EGG® Grill @ Natures Own just click below to go to the website to enter. Once on their site just scroll down to enter your information.